Check out this online Lethal League Blaze footage between Saxxy and Nobody, two highly competitive Lethal League players. Things heat up a lot! Aaaaand we’re back! After an exciting week in Las Vegas, we could only wish we had brought double the setups to better accommodate the interest of tons of fans and newcomers. Even when setting up the day before the event, we got a healthy reminder of just how enthusiastic players can get as the screams of a small crowd filled the otherwise empty venue. We chose not to put chairs down to have people get a turn faster. 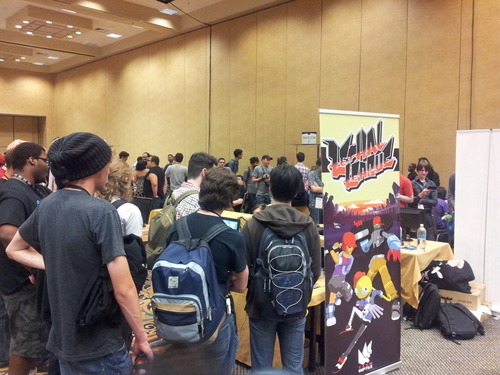 The first day had us busy showcasing Lethal League to the gaming press, explaining the game’s in-depth techniques and getting to know our neighbors, the Starwhal and Nidhogg development teams. Catching Super Smash Bros. commentator Prog during the first rounds of the competition to tell him about our upcoming release, he asked “Is there going to be a Lethal League tournament?”. Disappointed to answer we didn’t plan for any tournaments at the time, we went ahead and fixed that for the second day. We had a total of three 16-man competitions spread out over the day. The first was won by a player called Tim who quickly went back and forth from Lethal League to Killer Instinct where he also competed. Then a oft-returning player called Hazama took first place twice in a row. As the day came to an end, we met with one of our American voice actors, Carlos. We started off the third day with an 8 team doubles tournament. Team Monster eventually won over Team Iron Storm in the final match. Monster from Team Monster went on to win the last singles tournament afterwards. 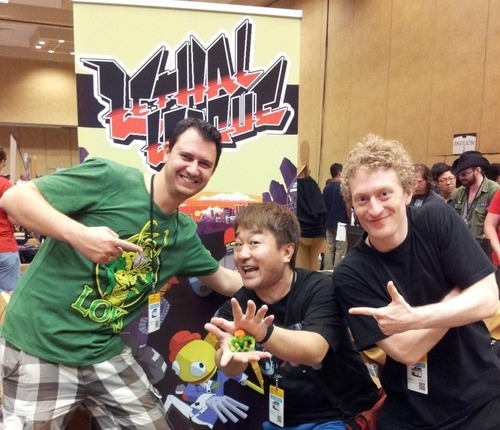 The day was punctuated by a surprise visit at the Lethal League booth by the producer of Street Fighter IV, Yoshinori Ono. To finish, here’s a shout-out to our new friends and fans that hanged out around with us or competed: Pikachad, Moose, Big Ben, Hazama, Tim, Monster, Rickie, Jay4Gamers1, Steve, Animefreak, Zach, Johnny, Snow, Juido, Alfredo, Monster, Carlos, the nidhogg and Starwhal teams and everyone who’s name we either didn’t get or wrote down! Thank you and I hope we meet again! Enter your email address to subscribe to Team Reptile. You will receive notifications of new posts by email only. Lethal League is coming out on Xbox One & Playstation 4!